1 photographic print : b&w; ; 5 x 7 in. 1 negative : b&w; ; 120 mm. Published in Rafu Shimpo, April 9, 1969, Japanese section. 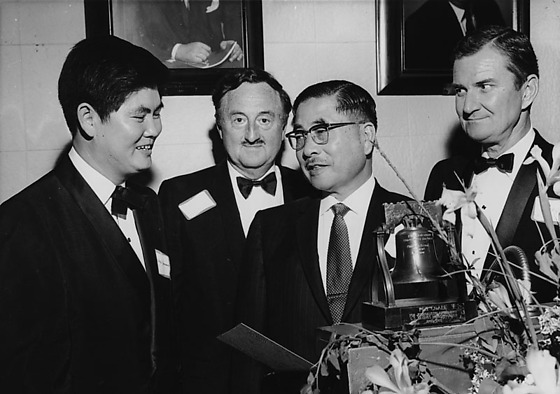 Judge John Aiso and Mike Yamano with two Caucasian men at Pacific Trade Night at the Los Angeles Press Club in Los Angeles, California, April 8, 1969. Mustached Aiso in eyeglasses and suit stands in center talking to Yamano at far left in tuxedo with name tag. Vic Washbourne (? ), an older mustached Caucasian man in tuxedo with name tag, stands slightly behind them in center while Los Angeles Press Club President John Lawry (? ), Caucasian man in tuxedo, stands at far right. A Liberty Bell awards sits atop podium next to floral arrangement in foreground bottom right. Portraits of men hang on wall in background. Typed on original negative envelope: L.A. Press Club -- c/o Mike Yamano -- Pacific Trade Night.